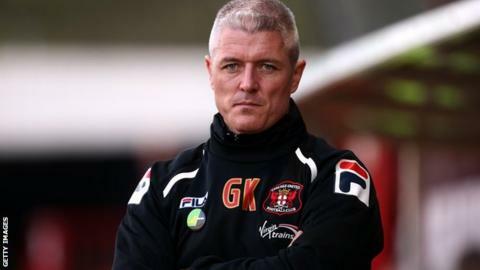 Carlisle United manager Graham Kavanagh is planning for League Two now that only an unlikely set of final day results can save them from relegation. The Cumbrians must beat Wolves to have a chance of staying up, though if Crewe draw or Tranmere win, they are down. Kavanagh told BBC Radio Cumbria: "There is deep sadness because we look like we'll lose League One status. Planning starts tomorrow and I'll leave no stone unturned to try and get us back there." The 40-year-old became caretaker boss in September after the with Carlisle third from bottom in the table, having collected two points from their first six matches. Three successive victories but since then the side have remained mired in relegation trouble, winning eight of their next 36 matches. "I was very proud of the boys' effort against Crawley, I though it was a gallant, energetic performance from a team desperate to win," he added. "Now, we need to put a plan in action to reshape the football club over the course of the summer." Before the midweek stalemate with Crawley, Kavanagh's goal-shy team - League One's lowest scorers - were dealt a double blow. Gary Madine could not feature because of curfew restrictions associated with his early prison release, and strike partner Lee Miller was left out for disciplinary reasons. "Lee, along with one other player, decided he wanted to do his own thing and not come to a meeting after we lost to Oldham on Saturday," Kavanagh explained. "I only want players who are committed. Has he let the squad down? I'm not saying that, that's for other people to decide."